When we arrived Miss Rosie and her new friend, Miss Poppy, refused to get out of the car, however, as they had heard the same stories I heard as a child, of the devils dancing here at night, gleeful at the thought of baldly behaved children. So we decided to take you to a magnificent park a few miles away. As Miss Rosie and Miss Poppy are both dressed in MacKenzie-Child’s Courtly Check pattern, we thought this destination would be most appropriate! 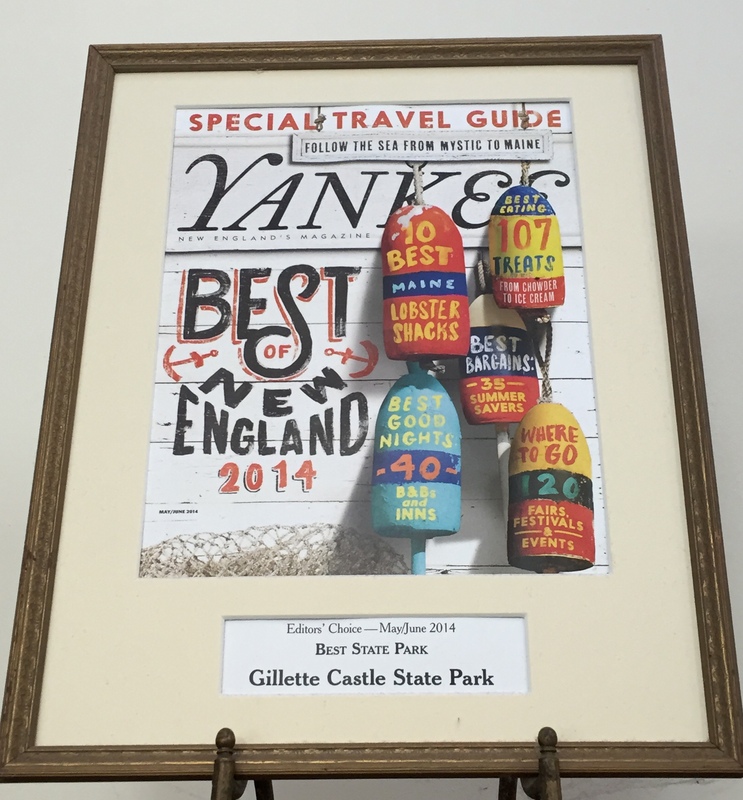 Not only is this our New England version of a castle, it’s also been voted the Best State Park in New England by Yankee Magazine, a very big honor in this corner of the USA! 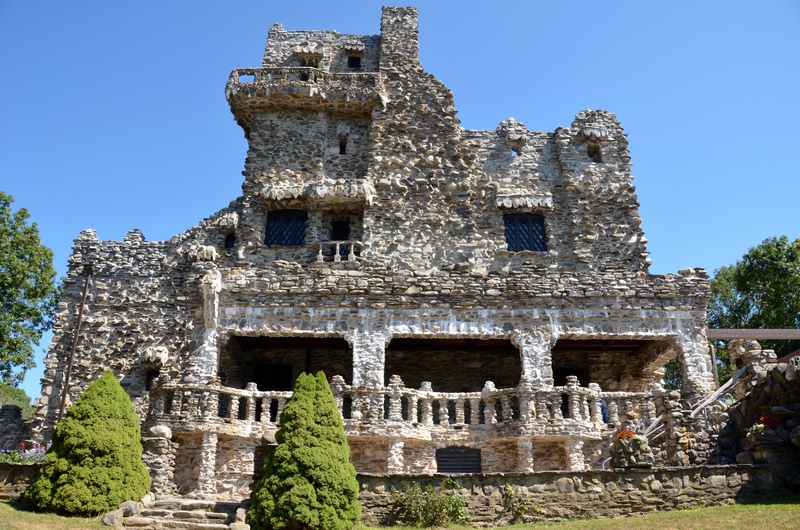 But before you start thinking razor blades and shaving cream, this delightful park is the result of the extreme imagination and wealth of William Gillette, the stage actor who made Sherlock Holmes famous. His interpretation of the character has become the standard: the pipe, hat, cloak, and even the famous phrase “Elementary, my dear Watson” would not be part of the Sherlock image if not for his creativity. He was as famous during his time as any actor today, and was paid enormous sums to travel the world putting on his shows. He built this castle on his retirement from the stage, and entertained several US presidents and others including Albert Einstein and his wife. 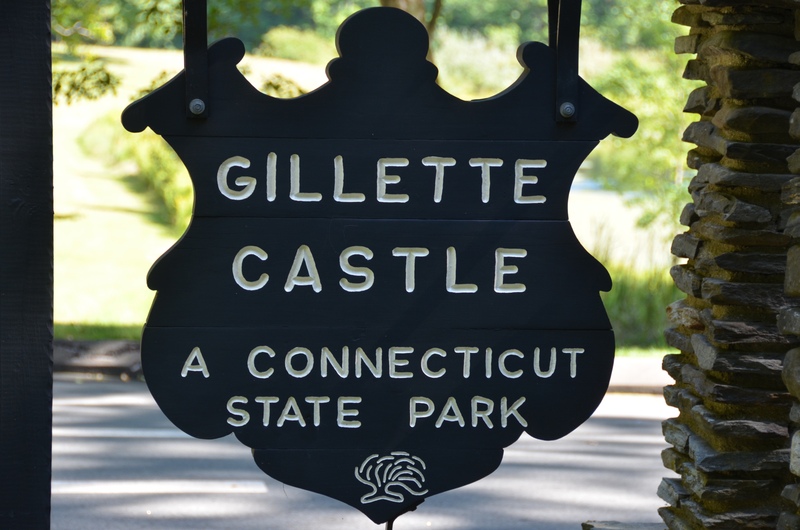 As a child Gillette lived in Hartford, a neighbor and frequent visitor of Mark Twain and his family. He was also an inventor and railroad fanatic, so he built a small railroad on the estate. He drove it himself, terrifying his guests as they sped along the rails. Einstein was said to be especially terrified. I’m guessing he was doing some quick calculations and the physics of the speed and curves didn’t present a pretty picture. 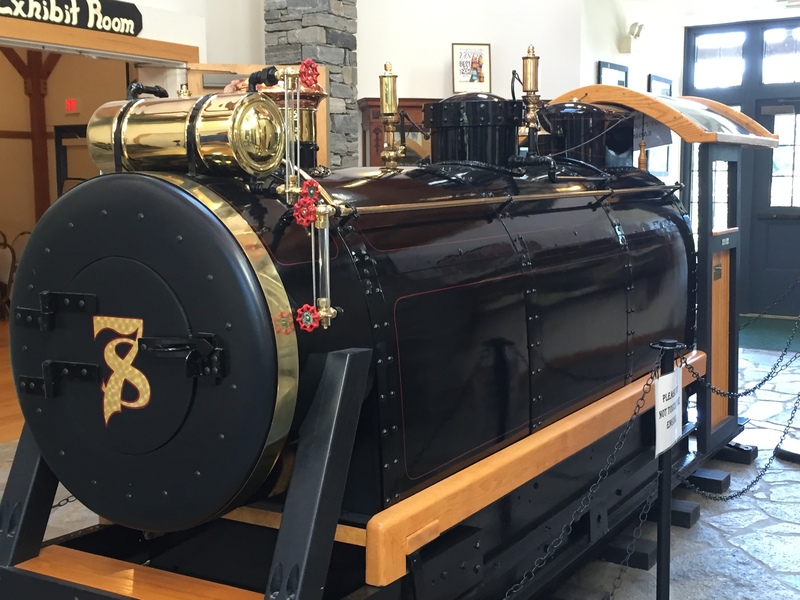 I know you’re thinking, how boring can this be…a train…a visitor’s center…but NO! It is actually quite fascinating! Miss Rosie was very impressed. Let’s start with the grounds and see if you agree. Beautiful stone walls surround the castle. Here you can see a piece of the railroad track. Several railroad stations were named after real NYC stations. 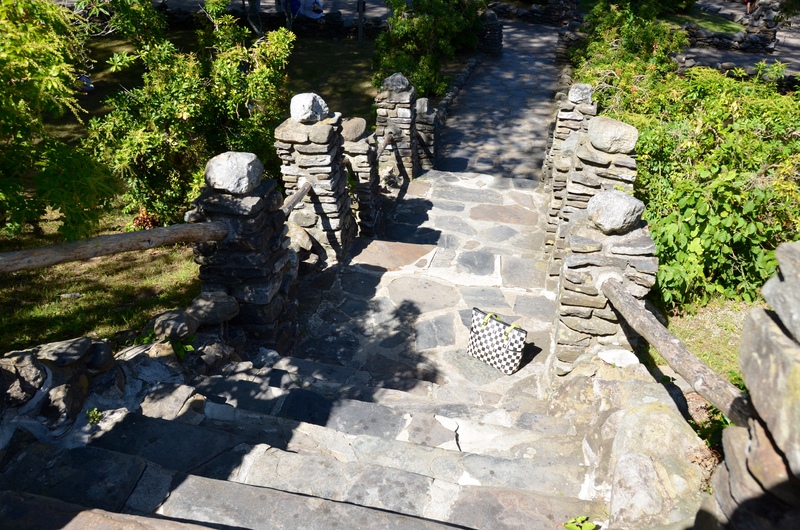 Miss Rosie climbed the stone stairs to the front door. 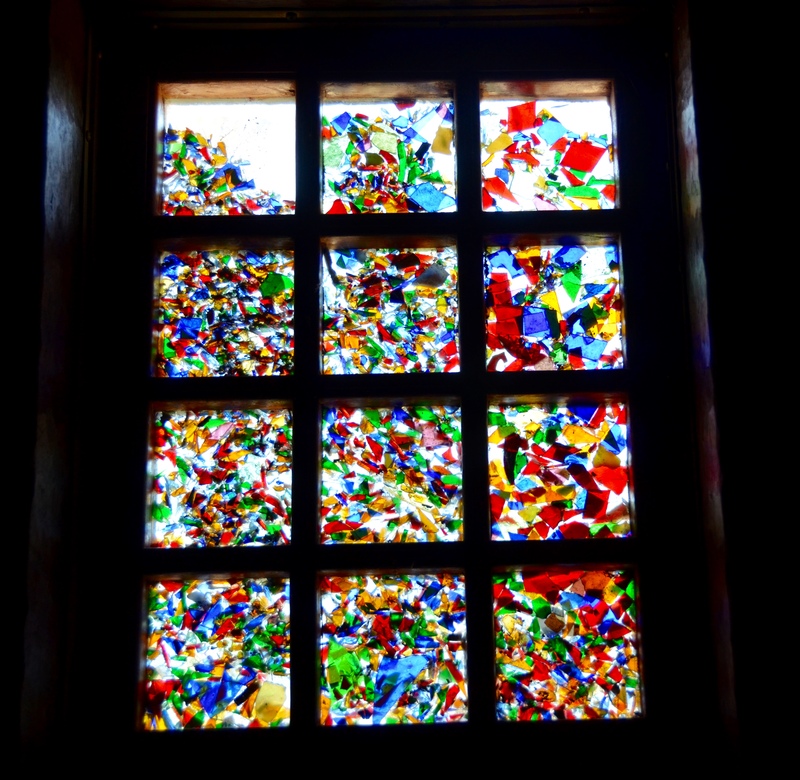 This structure looks like a ruined castle on the outside, but inside it is filled with beautiful glass, lights and windows, some of which were made by Tiffany. 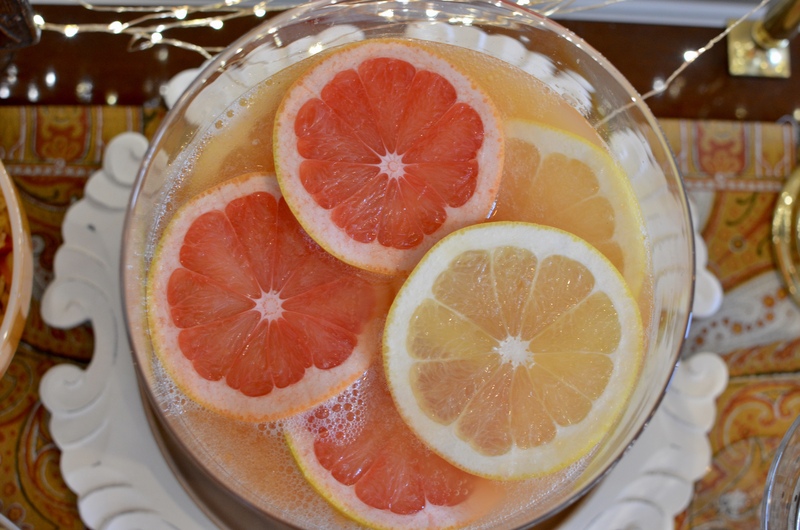 Not this one, but I love it! I could find a place for this one. I think this is a Tiffany. 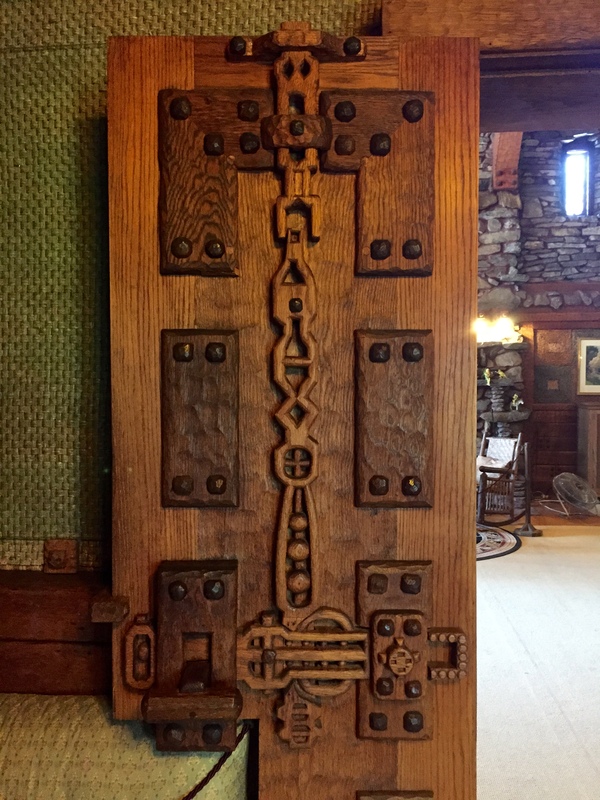 Every door in the castle is hand carved and unique. 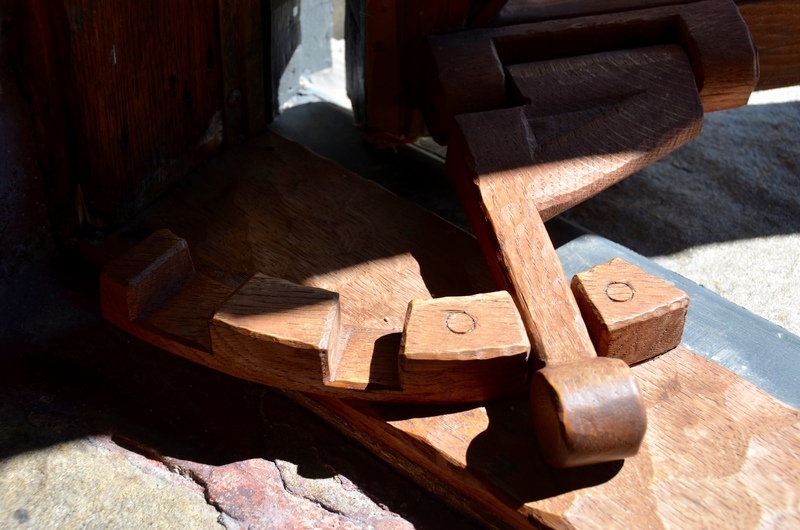 The house is also filled with Gillette’s little inventions, like this window stop. And I’m always excited to see a real Seth Thomas clock, made in the town where I grew up! This one is being guarded by pre-Columbian figurines Gillette is thought to have received from Teddy Roosevelt. 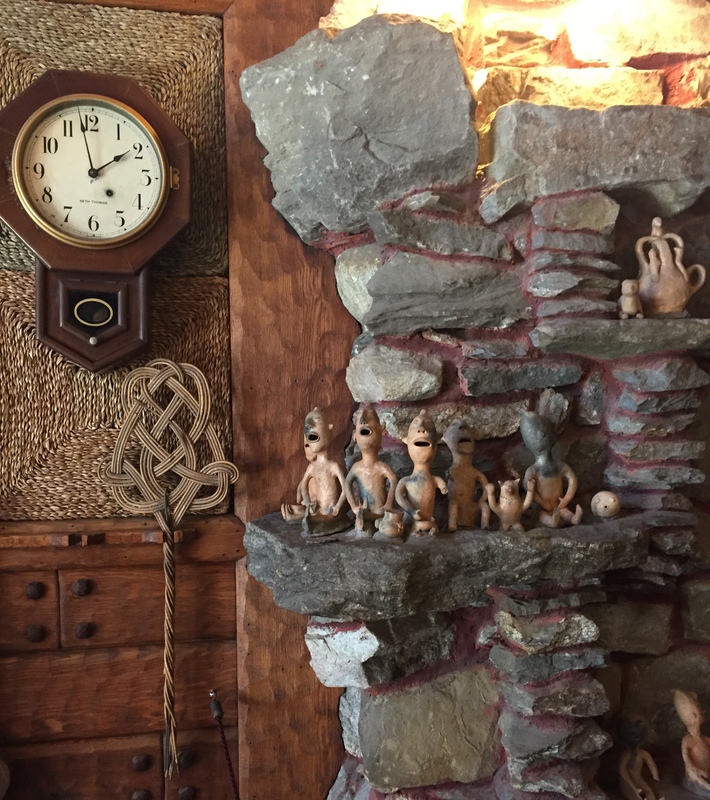 The interior walls are hand carved wood, local stone, and grasses which provide insulation. 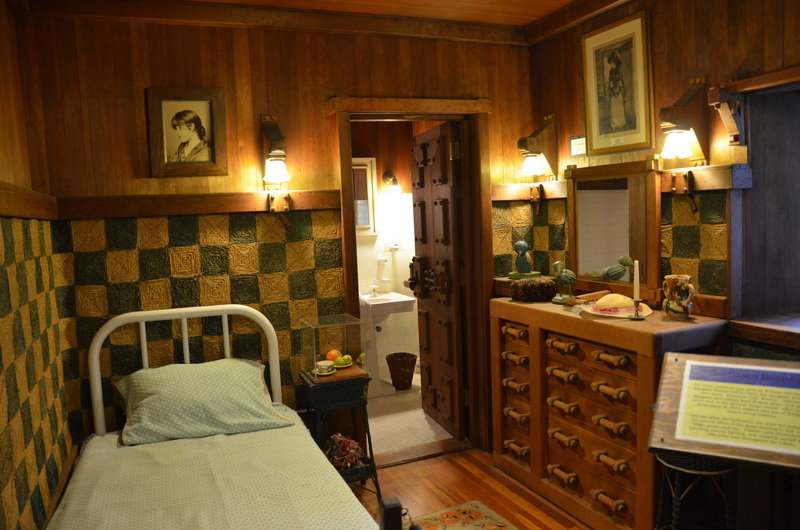 This little bedroom is typical of the rooms, but in the 1910s, ’20s and ’30s, private baths were a luxury and visitors were quite happy with the accommodations! 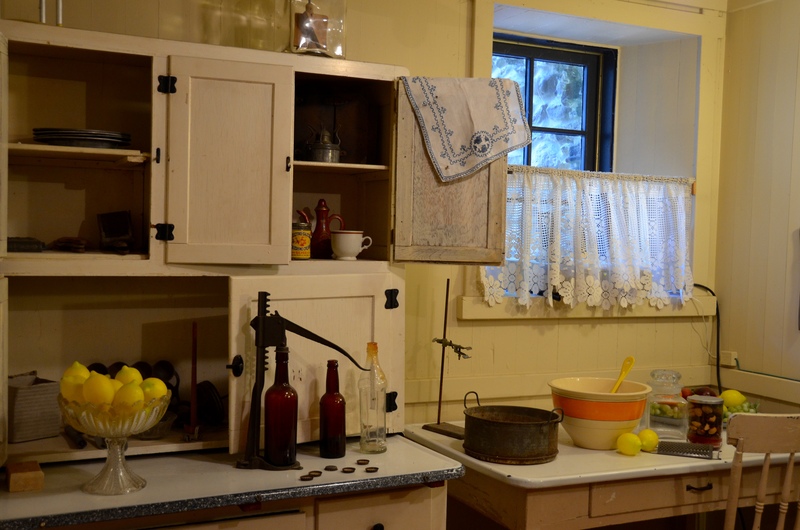 I know that today we all need huge kitchens with all the latest gadgets and marble, but this little kitchen provided meals for presidents and other dignitaries who flocked to Gillette’s estate for a bit of rest and relaxation. 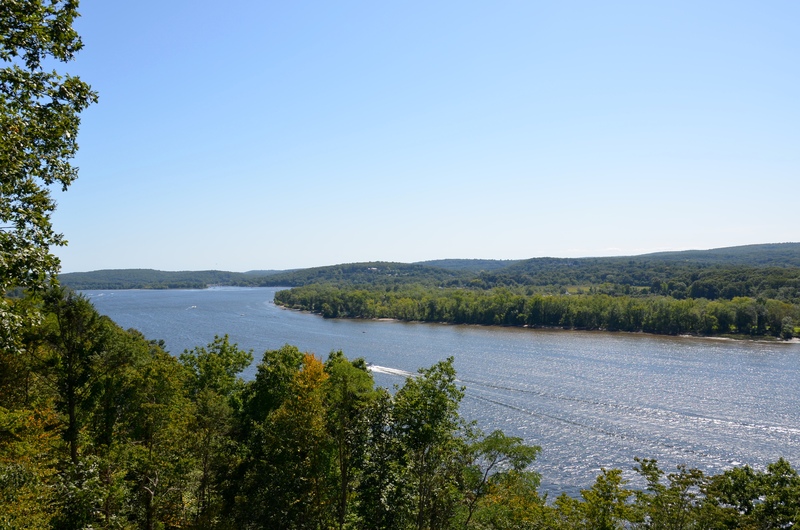 the magnificent Connecticut River, just a bit north of its mouth where it empties into Long Island Sound at Old Saybrook harbor. No wonder Gillette and his guests were in love with this place! 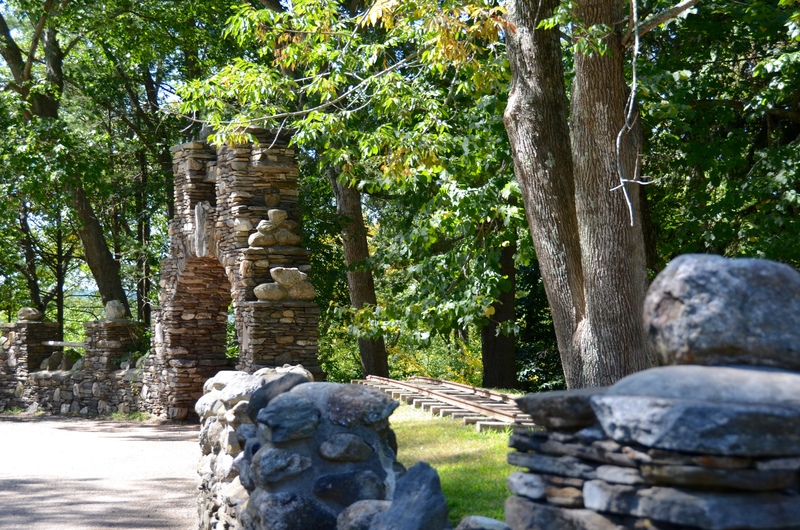 In his will he arranged for the estate to stay intact, fearing that it would fall into the hands of “some blithering saphead who has no conception of where he is or with what surrounded.” Luckily the State of Connecticut purchased the entire estate and it is now a well-loved and popular park. After Miss Rosie and I took in this view for awhile, we were ready for fresh air and a picnic. And our new friend, Miss Poppy, held everything we needed! 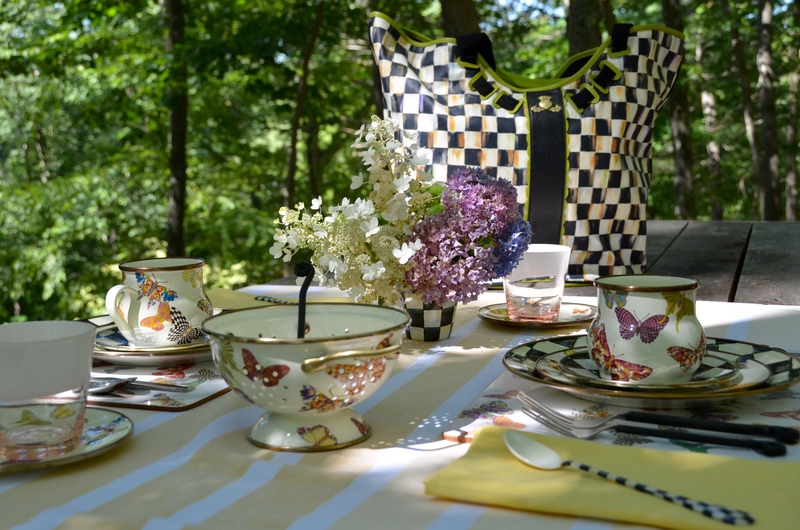 I could actually see myself becoming seriously obsessed with MacKenzie-Childs luggage and dishes. Every piece I add to my collection is beautiful! I packed Miss Poppy with an assortment of enamel Butterfly and Courtly Check dishes, a few sprigs of flowers from my yard, a beach blanket for use as a tablecloth, and some packets of food. I love the way the patterns work together. 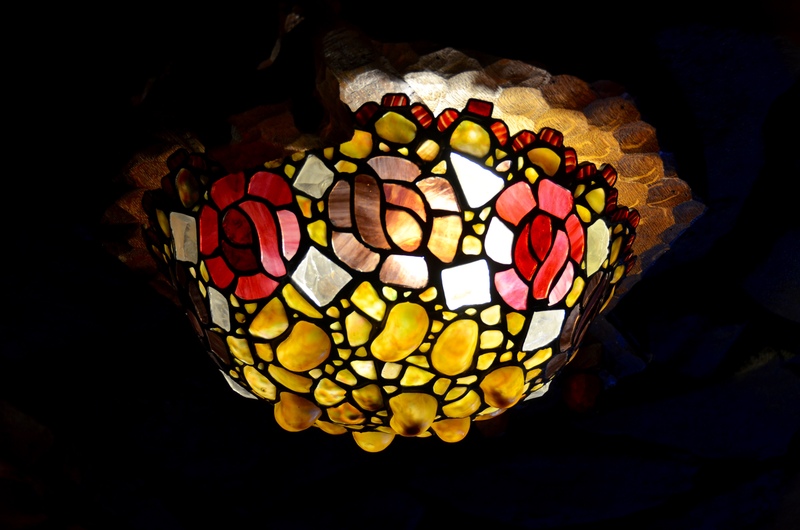 You might notice that the butterflies are made of snippets of various M-C patterns, some current and some retired. Do you see a favorite pattern? 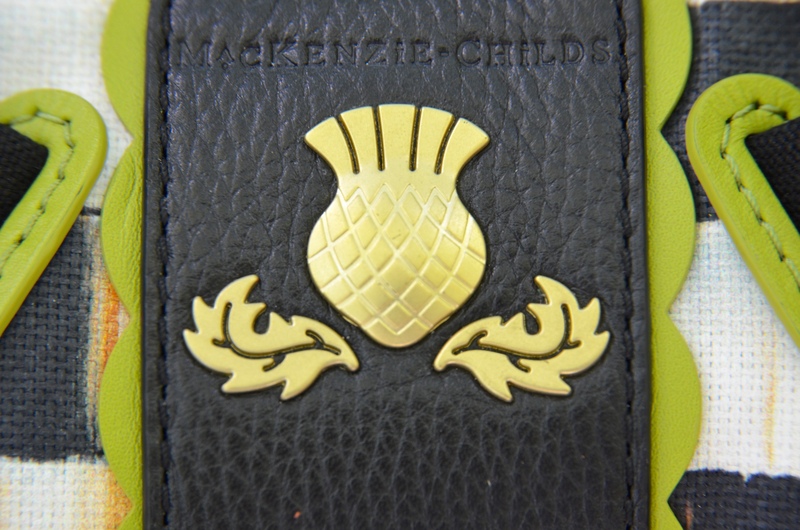 If you are a fan of Courtly Check you can find the story of its development on the MacKenzie-Childs blog, Chartreuse. The table looked even better with the yummy chicken and pasta salad I brought along. 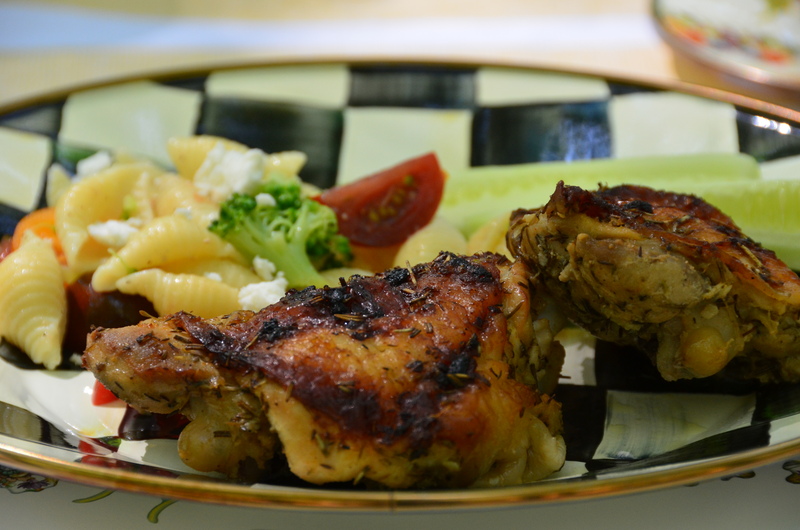 This chicken is made from a recipe I found last summer when the Novel Bakers did Picnic Week. It is delicious, with soy sauce, lemon juice, olive oil and rosemary. Dessert was an easy lemon pound cake (use the side panel recipe on a lemon box cake~~very delicious!) 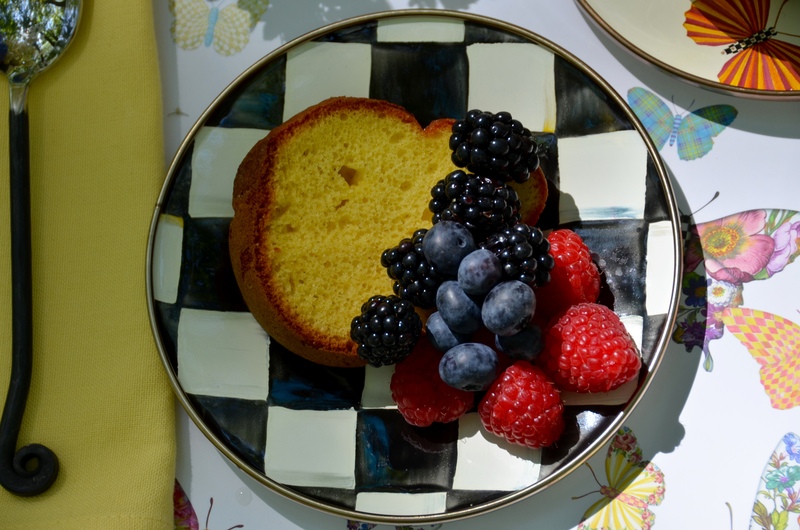 and fresh berries, served on Courtly Check dessert plates. 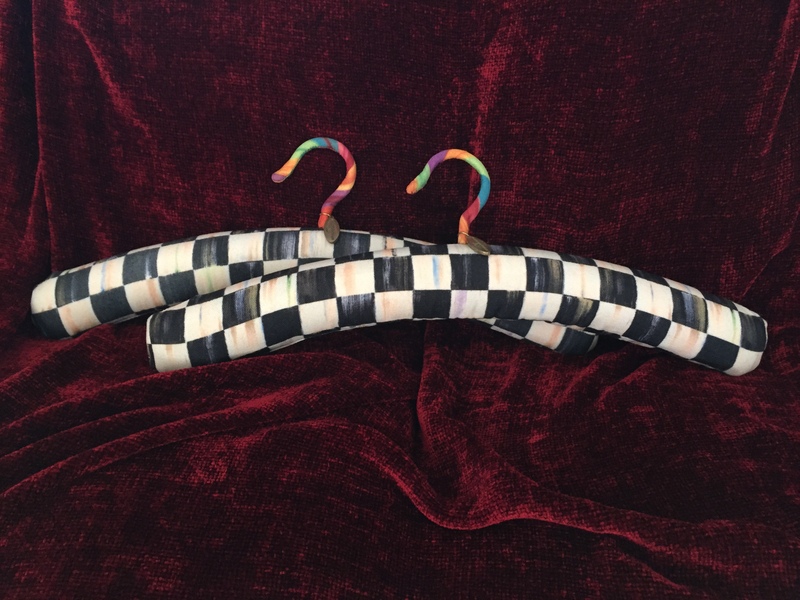 And speaking of Courtly Check, I would like to reward one of you who has patiently read through my very long Park Post with this giveaway of these padded linen MacKenzie-Childs Courtly Check hangars. Use them in your foyer closet for guests, or in your guest room for a pampered visitor, or treat yourself royally and tuck them into your own closet. I hope you love them as much as I do! To enter please leave a comment telling me something about your park visits or about what you saw here on our little trip to Gillette Castle State Park, and if you want another chance you can follow me on all or any of my pinterest boards here, and let me know in a separate comment. I hope you have enjoyed this trip to a park with me, Miss Rosie and Miss Poppy. 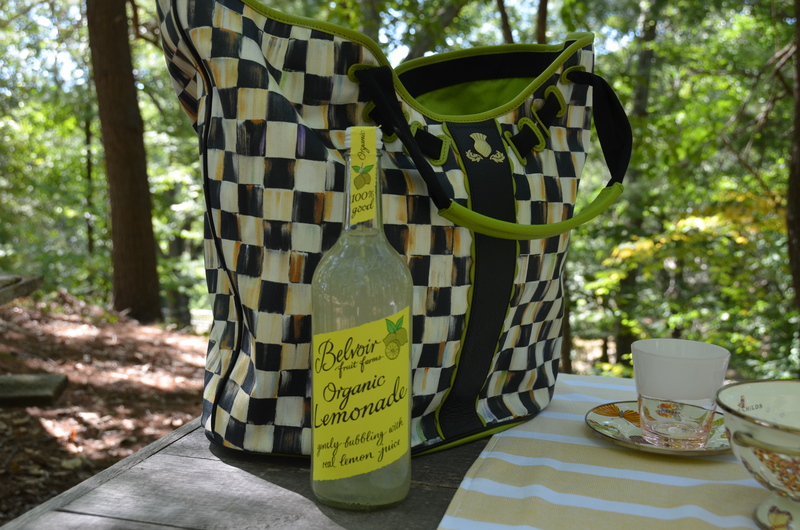 Visit other members of the Traveling Tote Tribe for more fun! What a delightful adventure! 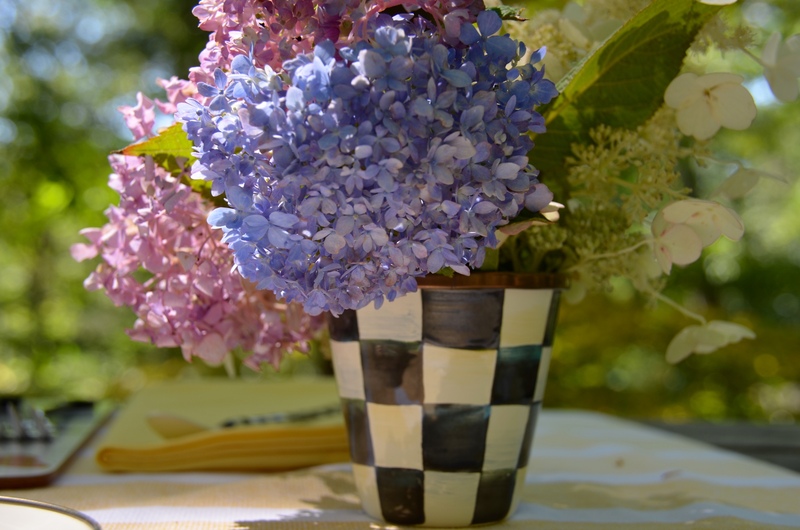 I love the beautiful table you set for a picnic lunch, too. And do I have a fav pattern? ALL of them – LOL! 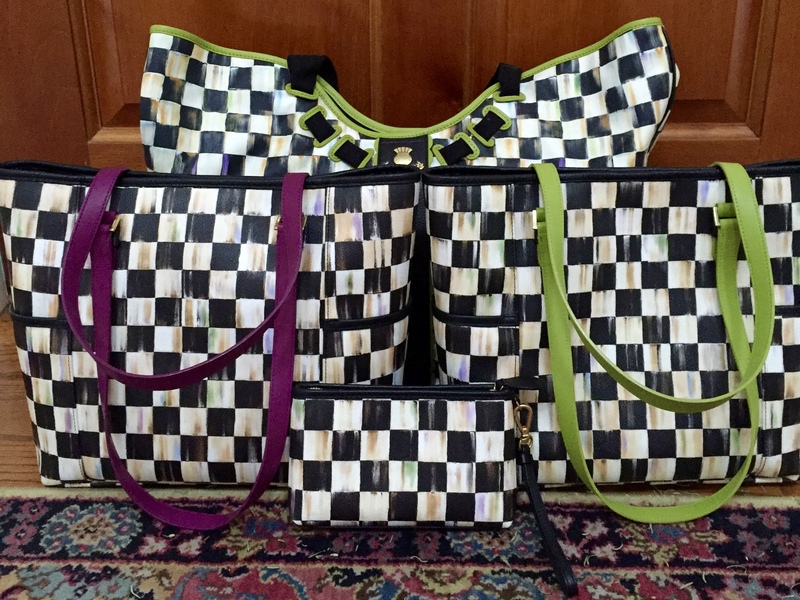 Happy to see you have added to your traveling totes – one can never have enough totes!! The park was lovely and it was fun traveling thru the area with you and learning a little history – Well done! This is the fanciest picnic I’ve ever seen Linda! You need to send this post to McKenzie-Childs, it should be on their website! 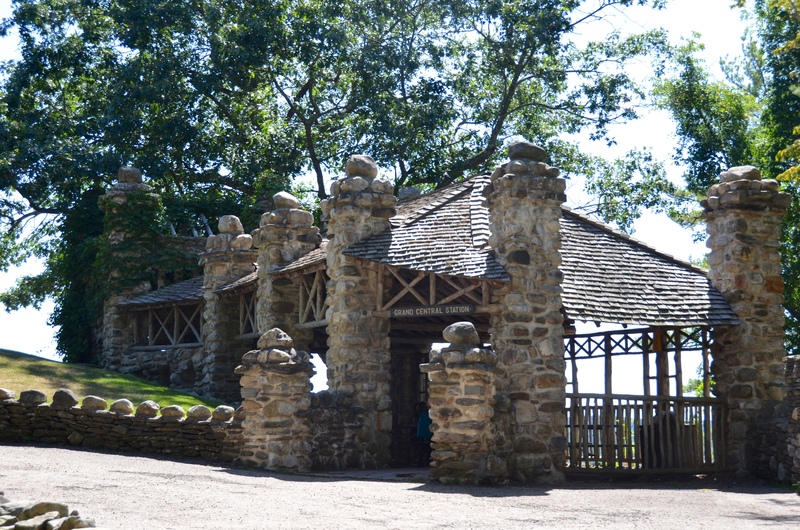 Your park in incredible and I was especially fascinated by the kitchen and guest room in Gillette’s castle and the doors! Wowza! Love the blathering saphead quote too 🙂 Sounds like an incredibly fun romp with your traveling totes! The hangers are too fabulous! Wowza, is right! I can’t imagine a more lovely park excursion. 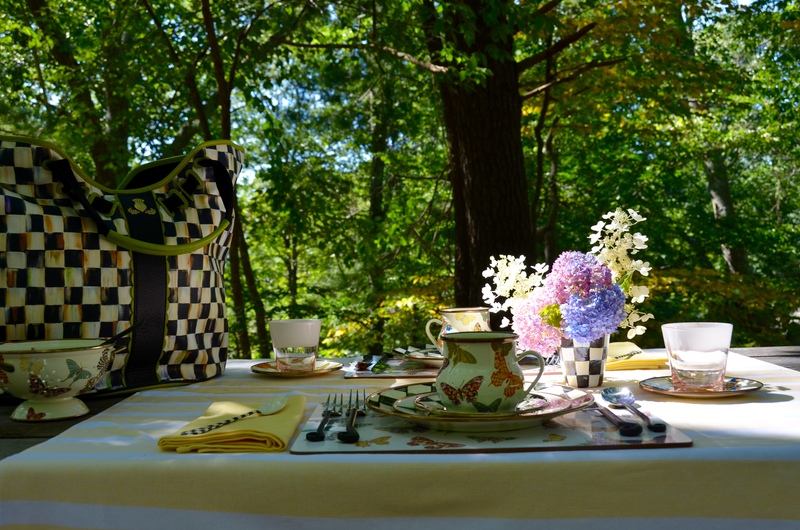 This has it all – history, view, nature, and an incredible picnic filled with exceptional MacKenzie-Childs goodness. I don’t have any of the butterfly pattern, but I think that is about to change! I’m totally smitten with your picnic fare, Linda. From the pretty dishes to the beautiful fresh flowers to the fabulous menu……life with Miss Rosie and Miss Poppy is definitely stylish! So excited to have Miss Poppy join the group! I enjoyed learning about Gillett. He must have been a fascinating character. I’m adding this park to my travel files for the next time we are in the east. Good luck to all the readers who leave a comment. Those CC padded coat hangers are fab! I’m sharing on my Facebook Page. Thanks, Linda! Wow, Linda, I love this park! The architecture is outstanding, and everything I would hope to expect to see in your part our country. There is so much history in New England, and I find every bit of it romantic. 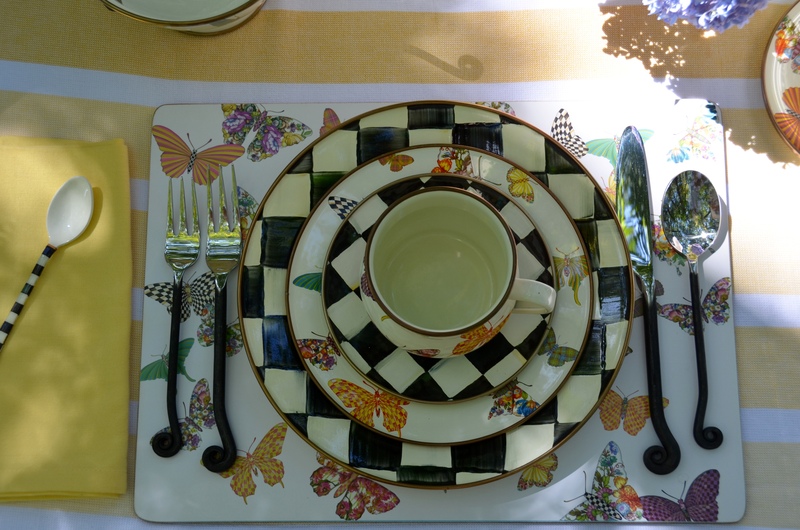 Speaking of romantic, your table setting is so wonderful with all the MacKenzie-Childs pieces together, and yes, they do all coordinate so nicely together. Here’s to many more outings with your Miss Rosie and Miss Poppy. Linda, I love how you captured the details of the tote in the first photo. 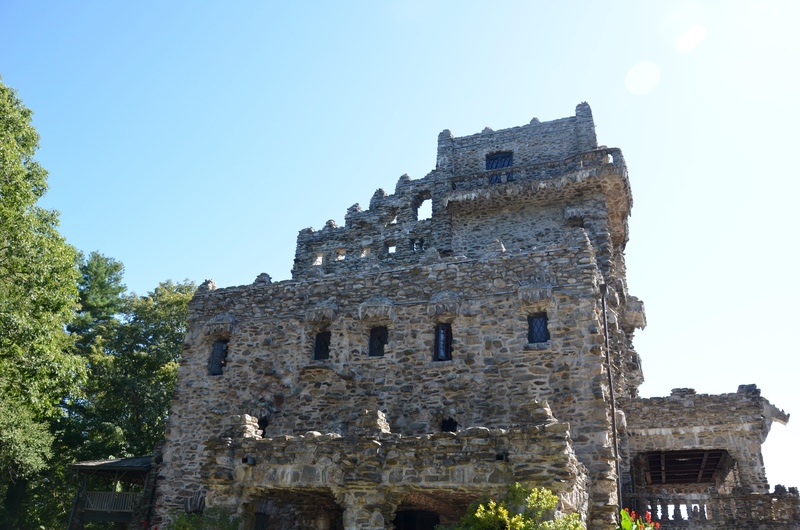 Gillette Castle and the park was the perfect spot for the classy, fun and sophisticated Miss Poppy and Miss Rosie to enjoy the day. I bet they loved the picnic most! Love how they toted some of my favorite dishes. Thanks for taking us along with you! I so enjoy reading your posts and scrolling down to see the next photo and the next…such anticipation! 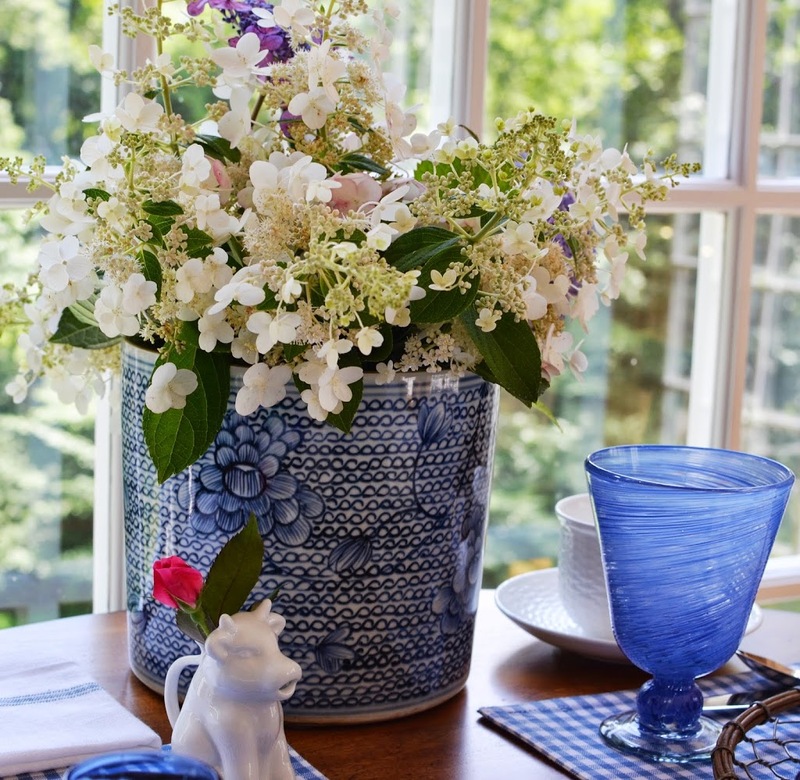 When I think of the my favorite pattern, I tend to enjoy Courtly Check as a backdrop and have, lately, been enjoying the white & black Flower Market pieces. Mixing & matching is helping me to bring the floral designs to my table and decor since I recently moved and have yet to seriously landscape our new home. My husband and I recently traveled to a few beautiful areas in the Thousand Islands region of New York State. We visited a number of state parks but our favorite stop was Boldt Castle on Heart Island in Alexandria Bay. As your pictures did, this Castle reminded me of a begone era and transported us back to another place and time. My tote (unnamed as yet) came along for the tour, but held a simpler snack of wine, dark chocolate and a nibbles of cheese. 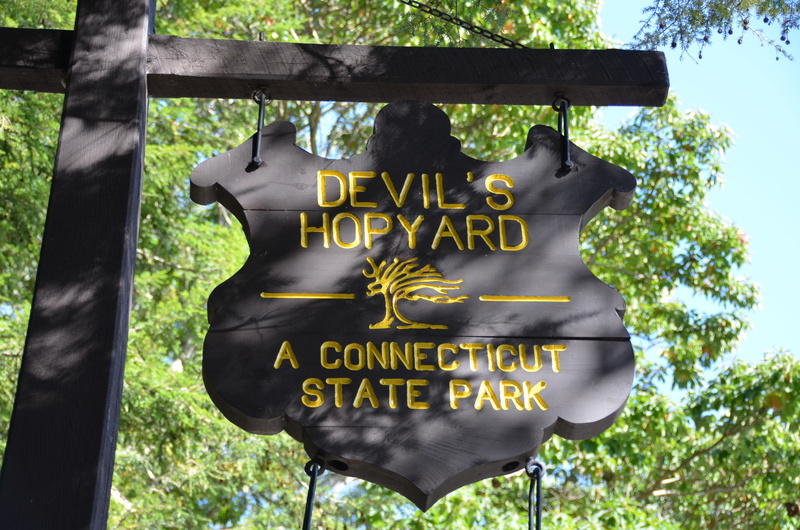 Thank you for sharing the photos of this beautiful park, it is on my list for October, as we travel throughout New England! 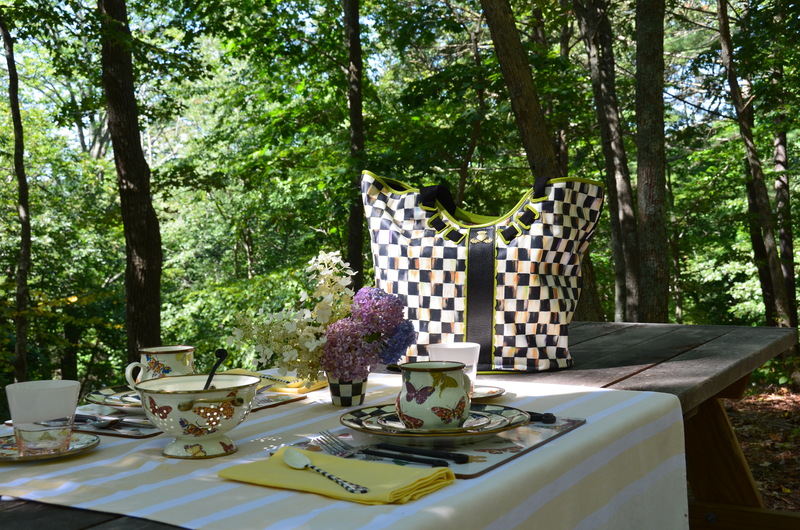 I am in love with MacKenzie Childs and enjoy your adventure of travel with the Courtly Check tote. If I won these, I would use one to hang my wedding dress from on an antique dress form holder that resembles a birdcage stand. So awesome! These travelling tote adventures make me want to get a tote so I can go on adventures.too. Lovely photos and table! 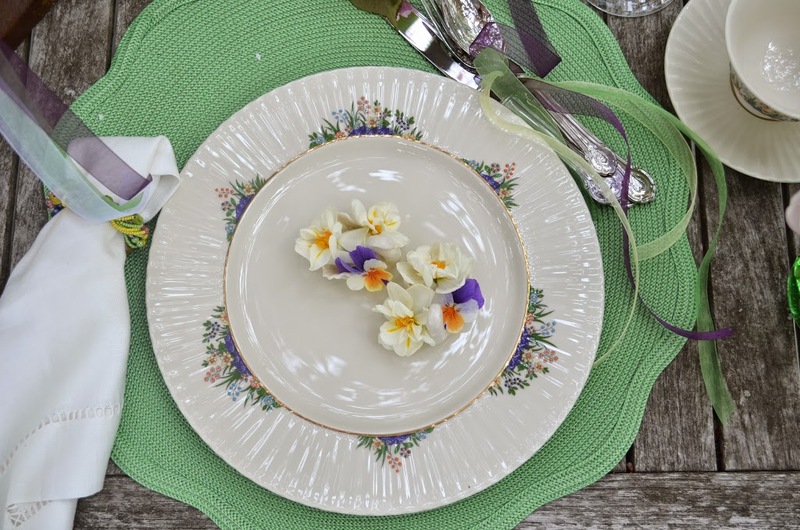 Your dinnerware is gorgeous. 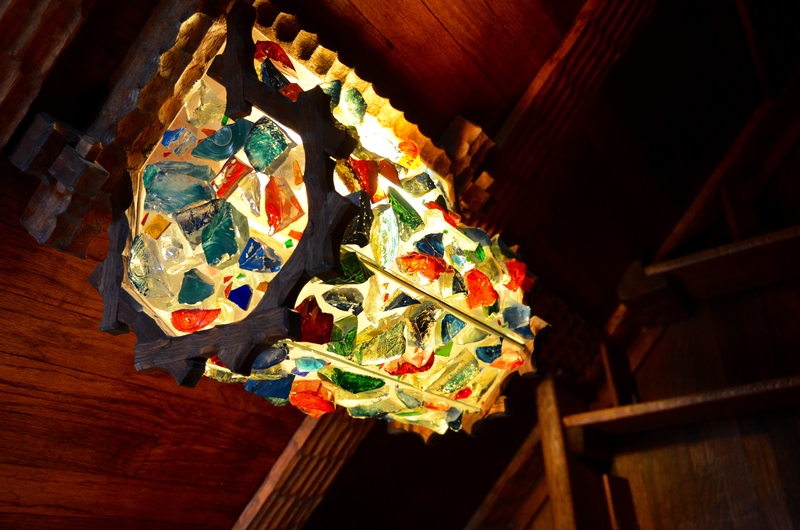 The Tiffany glass was so beautiful in the castle. What a lovely place to tour and then enjoy a picnic. Thanks for sharing your adventure with us. What a lovely picnic table setting! The food looks delicious too. I would like to have the recipe for that chicken. 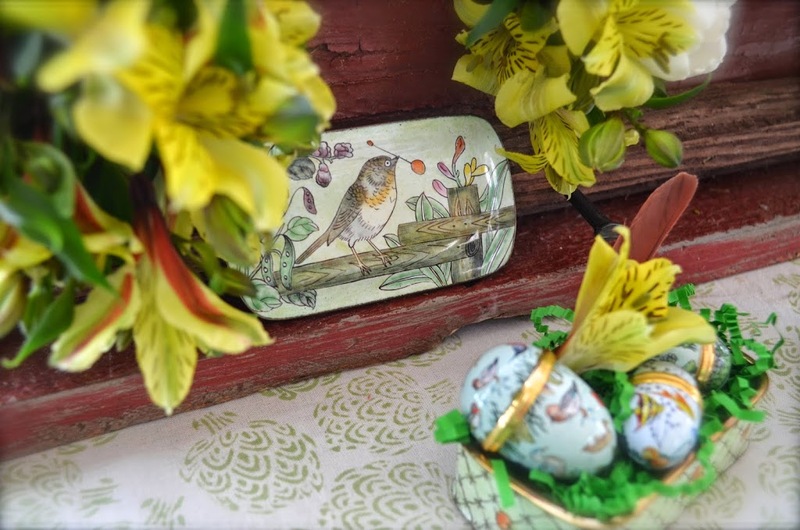 What a fabulous tablescape! I certainly enjoyed all your lovely details. 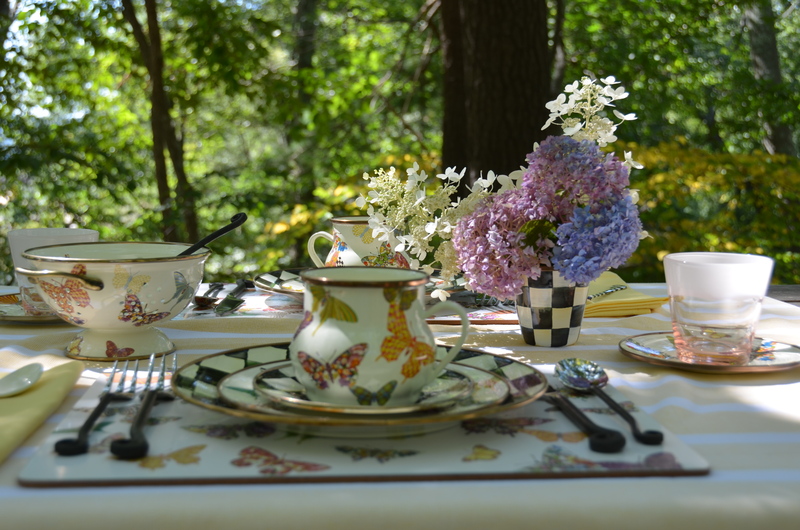 Linda: The picnic location and the table setting are simply perfect. 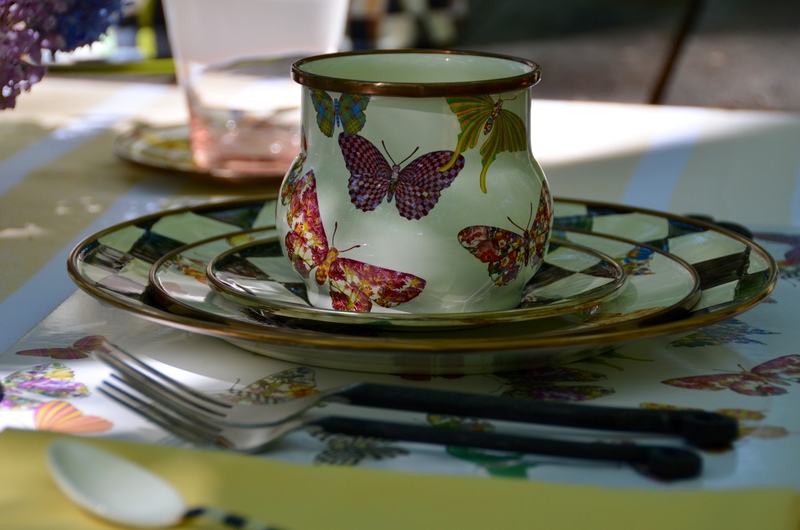 I love the butterfly dishes that complement the Courtly Check. So beautiful! The “blithering saphead” comment had me laughing out loud. The phrase perfectly describes a certain individual making news lately. Love that you bring you hydrangea everywhere. Now that I have a few bushes in my garden, I’m beginning to do the same. I can’t wait until the bushes get a little bigger! What is that white flower that you brought? I saw Michael Lee also uses it on centerpieces. Is it another variety of hydrangea? Your picnic posts are among my favorites. Please keep traveling! I’m so sorry that I didn’t get a chance to see the home and park while I lived in New England. Perhaps I’ll get a chance to visit on a return visit someday. Lovely post and such a pretty picnic table laid out with a delicious looking lunch. Every time I see anything with Courtly Check, I turn green with envy! 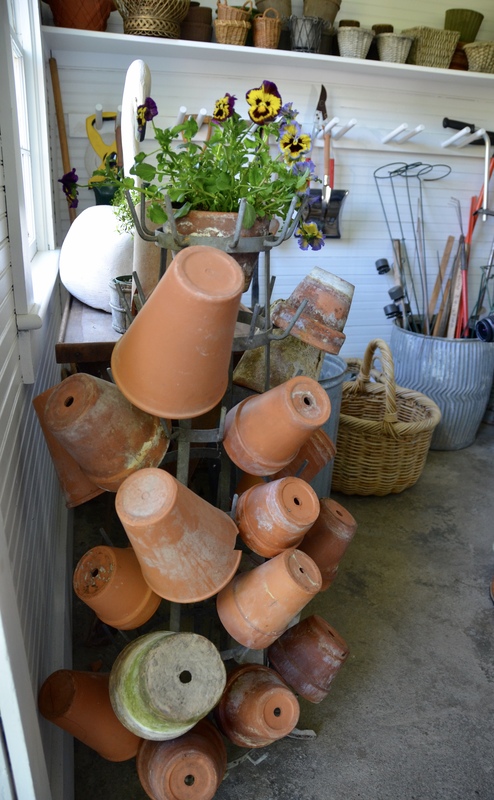 I only have the canister set – how I would love a table full of them. 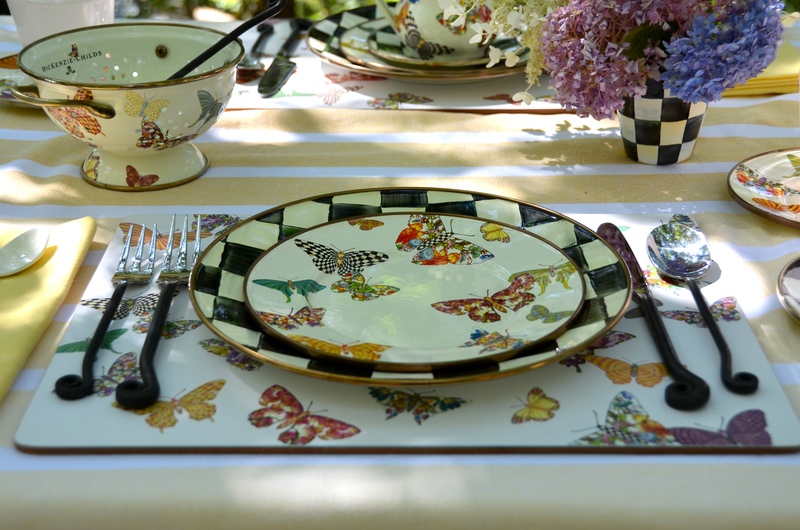 What a lovely table you have set and I love that you pointed out that the butterflies are all different MC patterns. What a beautiful park. The stone work is out of this world. Of course here in Utah, we have fabulous State and National Parks. Miss Rosie should come visit – she would look amazing up against the orange and red rock formations. Our favorite is Canyon Glen State Park – Lake Powell, and of course Zions and Bryce Canyon. I am in St. George right now, 4 hours south of us and we love to go to plays up in Snow Canyon State Park where they have an outdoor theater right up against the red rocks. Thanks for taking us along! Hope I can take some hangers along with me!